Features of Community: Waterfront condo community, boat slips, no pool. 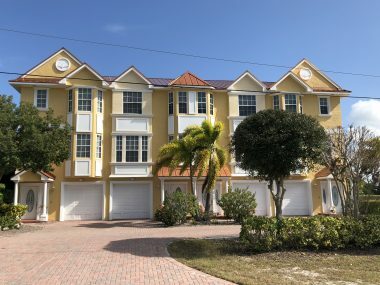 Bass Harbour is a four unit ultra luxury waterfront condominium complex located at 1410 Park Beach Circle in Punta Gorda Isles, with assigned dock for your power boat or sailboat. Bass Harbour is located only a few hundred feet from the harbor. The units are three bedroom, three baths and almost 2,100 square feet of living area. Each home has a private elevator to take the owner to the garage to the two upper floors with living area. No bridge to open water, minutes out. Large, deep garage that can fit two cars in tandem. Pets are permitted in this condo. Enjoy dinner at one of the many restaurants in Fishermans Village or dance the night away at Harpoon Harry’s, only a short walk from your new home. Isles Yacht Club is also within walking distance, a great place to meet friends and socialize. Downtown Punta Gorda is a quaint, historical city only a bike ride or quick hop in the car from this complex. There you will see the brick paved streets made from the discarded ballast of trading ships that came to Punta Gorda in the late 1800’s to pick up loads of fish or cattle to transport to Cuba or north. The center of town has a number of fine restaurants as well as shops and galleries. Stop by the Railroad Museum, the historic station that was the southernmost point of the west coast railroad. Punta Gorda airport is only ten to fifteen minutes from Bass Harbour Waterfront Condo. Southwest Regional Airport in Fort Myers is about a half hour away.